In this space, our chefs will share with you from time to time one of their little secrets. 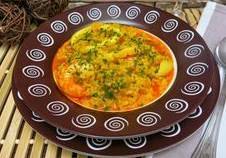 SALSAFÍ soggy OF RICE AND SHRIMP. 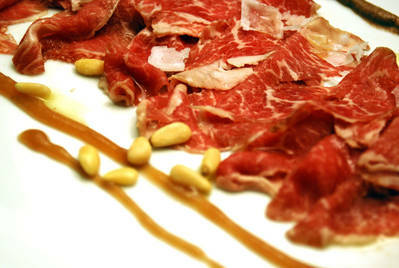 Beef carpaccio with shavings of Parmesan. INGREDIENTS: 1 Beef Tenderloin 1L Extra Virgin Olive Oil 50 grams of parmesan Maldon salt For the False Tapenade (vinaigrette): 50 grams of pitted black olives 25 grams of pistachios 25 grams of roasted almonds 25 grams of toasted hazelnuts Salt and extra virgin olive oil Elaborations: Clean the beef sirloin, cut it in half, and place 24 hours macerating in extra virgin olive oil. Once 24 hours have elapsed roll in plastic wrap so that it is a compressed cylinder and freeze. For the fake tape swim crush all the ingredients and incorporate the oil slowly to go emulsifying, obtain a thick but light sauce and set aside. Once caught cold sirloin Hague, ie a freezing point, we will have to fillet it finely and expand on the plate. PRESENTATION: Once extended season with Maldon salt and dress with fake tapenade.Incorporar parmesan chips and ready. 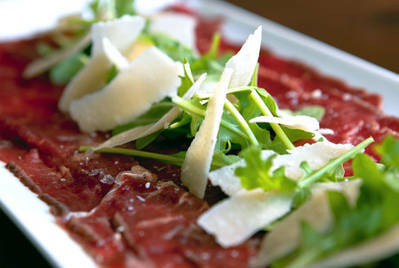 CARPACCIO bresaola, arugula and truffle acetate.